Here's a GI Joe fun-fact for you: the shortest filecard in the toyline's history was only 17 words long, and it belonged to the obscure 1985 version of this guy. Tripwrie is an accident waiting to happen. He's clumsy, jittery, all thumbs and a nervous wreck around people, unless he's working with high explosives. Then he's calm and collected, with the skill and precision of a surgeon. He spent two years in a Zen monastery pondering the meaning of life, until he was expelled for breaking too many dishes and spilling every liquid in sight. Determined to make something of his shortcomings, he joined the Army and found his calling on the grenade range. Something about setting off explosives and watching bombs bursting in the air relaxes him. Hard to believe for a guy who seems to trip over air. His ease around explosives is why he is so cool and calm while hovering above a sea of red-hot lava to retrieve the metallic element for the MASS Device machine. This same figure was available - with absolutely no changes - in a 2008 Comic Pack. If, like pretty much everyone else who ever bought some G3 Joes, the last thing you needed was yet another Cobra Commander, then Hasbro offering Tripwire by himself was very welcome. Tripwire is made from the Flash/Grand Slam body, with new shins. It's a decent representation of the old uniform, though the HISS Driver would have been better: it's smooth, rather than textured. The original Tripwire also didn't have any pads on his thighs, but that's hardly a change worth complaining about. The upper arms look like they're reversed, because the pads on his biceps tip inward, rather than out; however, every version of this mold has had the same "problem," and the sculpt makes it obvious that's the way it's meant to be. It may sound silly, but the new boots really sell the body as being Tripwire, rather than a repaint. The head is new as well, of course. Trip wears a fairly distinctive helmet-and-goggles combo, and no amount of clever repainting other figures' heads would properly duplicate that. There is one immediately noticable difference between this helmet and the 1983 version: the size. While the old one was fairly small and tight to the head, this one is sized realistically to suggest a human head is inside it. Unfortunately, if you're used to the '80s figures, it makes him look like a bobblehead. Tormod (yes, that's his real name - "Tormod Skoog") is painted a light olive green, and his pads are dark grey. The boots and gloves are a lighter gray, and his goggles are black. He has a red rank insignia painted on his right bicep, just as the original did, but for some reason, it's painted upside down. Whoops! 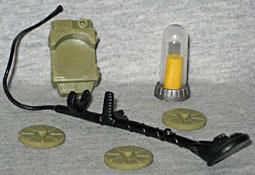 Tripwire has a black metal detector, which connects via a tube to his green backpack. The pack has a large circular gap in the center, designed to hold the three mines the set also includes. Why does he have mines? Because while his MOS is disposal, his secondary specialty is demolitions: he can pick up bombs, but he can also put them back down. This is one of the figures that comes with a jar of element for the MASS Device: in this case, yellow sand. If they really wanted to re-release Tripwire outside of the Comic Pack, they could have done him in his Tiger Force colors - that's the version I had back in the day, and it would have been fun to get him again. That probably would have raised complaints that the colors weren't cartoon-accurate, but neither is the way he's painted now: in the cartoon, his uniform was dark green, and his goggles were clear blue. Tiger Force colors aren't any more incorrect than this, and would have given die-hards more of a reason to buy another Tripwire.